Bushfires in Australia are much more deadly to humans and animals and much more destructive today than only a few decades ago. This is the result of urban housing pushing more and more into the bushland, and the lack of aggressive intervention by creating defensible zones at the bushland-urban interface for the protection of homes and businesses. Bushfires have cost Australia many billions of dollars in damage to human life, farm animals, wildlife and property, including the cost of fighting the fires themselves and the rehabilitation of the devastated bushland to mitigate further fires where imperative. Wildfires cannot be prevented, but their devastating destruction can be mitigated to a great extent by developing defensible zones between the bushland and communities. This also applies to the protection of livestock and farmland, as well as Australia's precious National Parks. The process is simple and straightforward: Remove the under-story vegetation of the forests at the wildland-urban interface and maintain it. This will keep fires from encroaching onto land that ought to be protected. The process requires cutting, slashing and elimination of the forest wood waste. Chipping the wood waste, hauling it to a landfill and dumping it there is time-consuming and expensive, often cost prohibitive. It also contributes to climate change by releasing greenhouse gases from the large Diesel engines used for this alternative and also possibly methane from the rotting of the waste material in a rubbish dump. The simple solution is elimination onsite by use of above ground air curtain burners, also called FireBoxes, as designed and manufactured by Air Burners, Inc. in the US and now distributed and available throughout Australia. The FireBox is portable, deployed completely assembled and requires no external energy source. The wood waste is the fuel. Because it achieves near perfect combustion efficiency, all the CO2 that is released is "biogenic" CO2, the CO2 that the trees took in through photosynthesis while alive thereby releasing oxygen. The harmful climate-affecting smoke or "black carbon" is eliminated by the pollution control principle of the FireBox, the air curtain. That is why employing the air curtain burners is so environmentally sound. The Australian Forest Practices Authority (FPA) advocates the importance of bushland fuels management, but the employed methods are mostly "Planned Burns" or man-induced broadcast burns. Their major drawbacks are the massive release of climate forcing agents, namely smoke or black carbon, and the danger of run-away out-of-control burns with their devastating consequence. Moreover, planned burns are not suitable for fuels reduction in the immediate bushland-urban interface for obvious reasons. FireBoxes eliminate all of these concerns, and now with their cost-effective availability throughout Australia, they should be employed as the cleanest and most desirable method to dispose wood waste from fuels reduction endeavors, at least in the areas of the bushland interface with urban housing and farmland. Contact your Country or Rural Fire Service Authorities for permit related matters and advise them that you will be only disposing of clean vegetative (timber) waste, for example, for bushfire mitigation or post bushfire clean-up. What is a FireBox and how does it work? Air Curtain Burners, also called FireBoxes, were designed principally as a pollution control device. The primary objective of an air curtain machine is to reduce the particulate matter (PM) or black carbon or smoke, which results from burning clean wood waste. It is sometimes hard to visualize without seeing a machine in operation, but the machines do not burn anything, rather they control the results of something burning. You could look at it as a pollution control device for open burning. Clean wood waste is loaded into the FireBox, and the pile is ignited. This is very similar to starting a campfire. The air curtain is not engaged until the fire has grown in strength or the air curtain may blow the fire out. Once the fire has reached suitable strength, usually in 15 to 20 minutes, the air curtain is engaged. The air curtain then runs at steady state throughout the burn operation and the waste wood is loaded at a rate consistent with the rate of burn. Our smallest machine will burn at a rate of 0.5 to 2 ton per hour, our largest machine can burn in excess of 10 tons per hour. The purpose of the air curtain is to stall or slow down the smoke particles on their way out of the FireBox. In doing this the particles are subjected to the highest temperatures in the FireBox. Stalling the smoke particles in this region just under the air curtain causes them to re-burn, further reducing their size to an acceptable limit. The result is a very clean burn with opacities well under 10% per EPA Method 9 Testing (as compared to open burning which typically can run at 80% to 100% opacity). Successful bushfire prevention measures must include suitable disposal or eradication schemes for the forest debris that is being collected from cleaning out the forest under-story at the bushland interface with urban communities or farmland. It is cost-prohibitive to chip and haul the material away to landfills or other disposal sites. Also, undue greenhouse gases would be released from the massive Diesel engines of the wood chippers and trucks, as they are powered by hydrocarbon fuels releasing non-biogenic CO2. brigades, parks departments, home owners associations, forest service agency, etc. for smaller clearing and restoration jobs. The residual ash is a soil amendment with a portion of biochar and is usually land applied on location. The photos below show one of the larger suitable FireBoxes on the left and the popular BurnBoss, a trailer-mounted FireBox that is towable. They are both at government forest fuels reduction sites. How do Fireboxes reduce unwanted Greenhouse Gases? Disposal of Woody Debris by Fire with perfect combustion efficiency releases no Black Carbon (smoke or particulate matter) and virtually only Biogenic CO2, making this process carbon neutral. Black Carbon is a by-product of the combustion of fossil fuel, biofuel or biomass (woody debris); optimizing the combustion process will reduce the amount of Black Carbon released. Air Burners FireBoxes have been designed to achieve better than 99% combustion efficiency when burning wood waste, thereby eliminating virtually all smoke or black carbon from the forest debris burning. Black carbon releases are responsible for the premature melting of polar icecaps, Himalayan Mountain permafrost areas, etc. It is a climate forcing agent per IPPC (Intergovernmental Panel on Climate Change of the UN). Black Carbon tends to stay in the atmosphere for only several days to a few weeks, whereas carbon dioxide has an atmospheric lifetime of more than 100 years. That means, curbing Black Carbon releases today will have a near immediate positive effect on Climate Change. 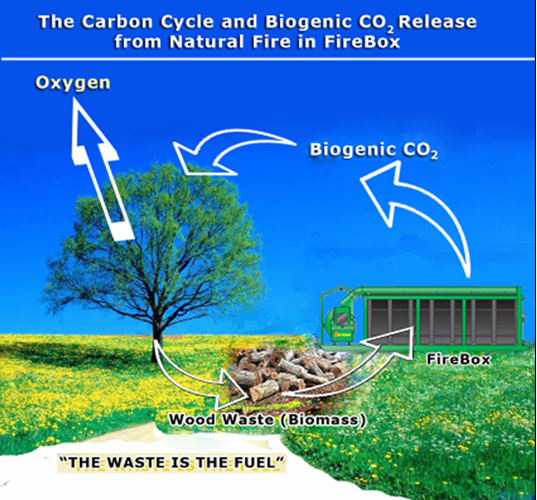 The FireBox burning wood-waste releases CO2 that is Biogenic. This carbon was stored in the plant (i.e. tree) for a relatively short period of time over the life of the tree or other plant and, through the natural biogenic process of photosynthesis, this carbon was absorbed from the CO2 in the air surrounding the plant in exchange for which oxygen was released, oxygen which is needed to make most life on earth possible. The carbon was sequestered in the wood while the tree was alive and growing, and the same carbon was returned to the atmosphere in the FireBox combustion process, making this burn process carbon neutral or giving it a net zero carbon footprint. The PGFireBox is used where large amounts of timber waste must be reduced in a cost efficient and environmentally friendly manner and where electricity converted from the heat energy released by the waste combustion process can be utilized on-site or sold into the local power grid. The system is a Whole-Log Wood Waste Air Curtain Burner coupled with an ORC (Organic Rankine Cycle) Engine. It completely eliminates the costly, polluting and time consuming pre-processing steps, such as chipping or grinding the timber waste to make it acceptable to traditional co-generation facilities. Long distance hauling is also no longer required. PGFireBoxs are currently offered with gross power ratings of 1 MWe (PGF1000), 500 KWe (PGF500) and 100 KWe (PGF100). Additionally, thermal energy is made available at the rate of 5 MWth, (PGF1000) 2.5 MWth (PGF500) and 1 MWth (PGF100). This thermal energy can be employed for a veriety of applications, such as supporting kiln drying operations at saw mills or drying crushed concrete before screening, further reducing current energy costs. 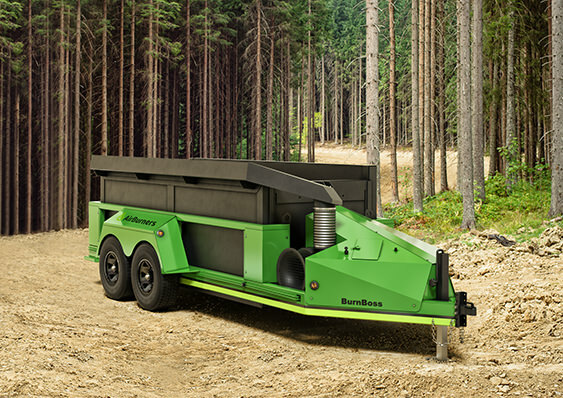 The PGFireBox Systems are portable and especially the 100 kW system can be readily deployed close to the location where the woody biomass is collected and as time goes by, re-positioned closer to the remaining wood waste source as that becomes practical. An example would be the need for forest rehabilitation where millions of trees killed by beetles or wildfires must be removed and disposed of for forest fire mitigation and to prepare for reforestation. Another application would be a PGFireBox reducing incoming wood waste dropped off at a landfill or transfer station for which usually quite handsome tipping fees are collected. Rather than grinding the waste wood and depositing it into the landfill to get rid of it (as most of the ground waste has little or no beneficial reuse as land-cover mulch or as fuel for traditional co-generation plants, primarily because of the necessary preprocessing cost), it would be reduced economically and environmentally friendly without pre-processing whatsoever in the PGFireBox. The additional benefit would be that the generated electricity would, of course, be utilized to power the air curtain burner itself, after that to support any other electricity consuming machine in the yard or forest landing and finally, any surplus power would be sold to the local power company into its power grid. The PGFireBox is foremost a portable system to get rid of woody biomass waste; it is not a traditional biomass power plant for which the biomass is a fuel that usually has to be purchased at a cost. The PGFireBox's return on investment is so formidable, because it rightfully can factor in the revenue from tipping fees, if operated at a landfill or transfer station, or for a timber waste generator, the avoidance cost of not having to pay tipping fees and related grinding and transportation cost for waste disposal. In the US, the PGFireBox system meets or exceeds all applicable EPA regulations for air curtain burners. The Australian EPA recently tested the Air Burners FireBox in Canberra (ACT) and developed emissions data to be employed for permitting the machines in Australia. A PGFireBox System consists of two basic units, the Air Curtain FireBox and the Power Unit and in the PGFireBox Video (above) for the 100kW model. An additional air cooling module is needed where water-cooling from a well, lake or stream is not an option. How is the FireBox mobilized? Except, obviously for the Rolloff FireBox and for the BurnBoss which is trailer mounted, FireBoxes are transported fully assembled on suitable trailers. Trailers, such as tilt-bed tag trailers can be used for the smaller FireBoxes, or low-boys and flatbeds can be used as well. A sliding axle tilt-bed trailer with a power winch, such as is custom made by Landoll for Air Burners FireBoxes, is ideal. How is the FireBox loaded? The BurnBoss can be loaded by hand, if convenient. Most FireBoxes can be loaded with a Skidsteer, Bobcat, tractor with a rake, front-loader or (best) excavator, all should have rakes and not buckets. How is the FireBox cleaned of ash? After the ashes have cooled and embers extinguished, the BurnBoss is cleaned out by raising the burn-box and briskly pulling the unit away leaving the ashes behind. The larger FireBoxes can be cleaned by using the ash-rake available from Air Burners, or by scooping out the ash with the bucket of a Bobcat, etc. How do you make sure you will not cause a brushfire? Common sense. Keep the area around the FireBox clean from debris, keep a safety distance from the closest trees and bushes, keep an eye on possible spot-fires, and discontinue burning, should the winds exceed the speed listed in the operatiing manuals. Always read the operating manual, and NEVER leave an operating FireBox unattended. Burning wood releases CO2; why is that not a bad thing? Correct, the combustion of wood results in most of the carbon contained in the wood fiber to be released as CO2. CO2 is a Greenhouse Gas that has a negative effect on climate change. The CO2 emitted from the FireBox combustion process is 'biogenic" CO2. The carbon contained in it was taken from the air while the tree was alive and converted CO2 to oxygen through photosynthesis. The same carbon would be eventually returned to the surroundings, were the tree to decompose naturally, that is rot away. Granted, some of it would likely be sequestered in the soil, but in contrast to FireBox combustion, the decomposition would also release Methane, a very bad Greenhouse gas, actually much worse than CO2. One could also argue that reforestation would offset the CO2 released from burning dead trees and slash from fuels reduction. The new stands will immediately take in CO2 from their surroundings and release oxygen. Biogenic CO2 is non-anthropogenic CO2, that means it is not caused by actions of man, and it would be released to the atmosphere earlier or later one way or another by nature. What then is "bad" CO2? Non-biogenic or "bad" CO2 is CO2 released from the incomplete combustion of fossil fuels, like coal, petroleum, Diesel fuel, etc. This Greenhouse Gas makes up the largest volume of all CO2 that has accumulated in the atmosphere. Considering that CO2 has an atmospheric lifetime of more than 100 years underscores how imperative it is, that worldwide measures be enacted and observed in order to reduce the rate of additional CO2 releases. Bad CO2 is the CO2 that originates from hydrocarbon fuels (coal, petroleum, natural gas). This CO2 or its carbon would continue to stay deep down in the earth for millions of more years, were we to leave it there and not bring it to the earth's surface for consumption. This bad CO2 is man-induced CO2 or "anthropogenic" CO2. How can you say that the FireBox is a pollution control machine? The air curtain burner has been designed to make the combustion of vegetative waste from Open Burning significantly cleaner. 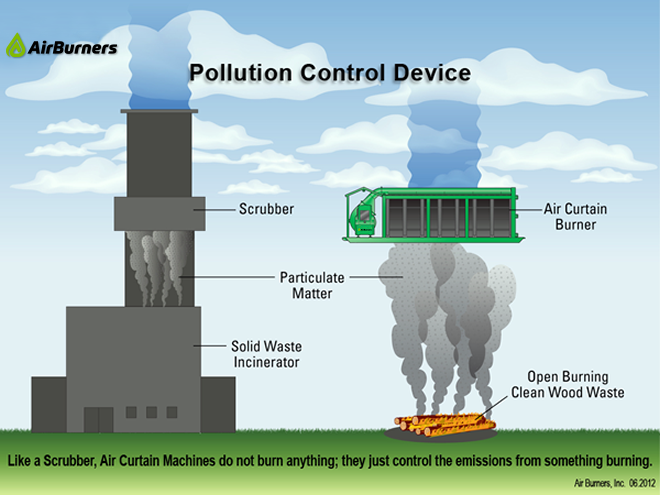 Just as filters and scrubbers in the smoke stack of a commercial municipal waste incinerator reduce the release of unwanted emissions from entering the environment, the air curtain burner prevents most of the particulate (smoke or black carbon) from the combustion process from getting into the environment. The image below strikingly highlights that principle. There is also a commercial component to this: because air curtain burning is significantly faster than open burning, and "time-is-money", using the air curtain burners makes a particular project more profitable. I understand biogenic CO2 - but combustion releases a whole lot of CO2 all at one time, is that not a bad thing? The amount of all CO2 that is released each year is in the many billions of tons range. CO2 that is non-anthropogenic such as is released by wildfire, volcanoes and natural seeping of gases from the earth center or oceans is only a fairly small amount of the total. Nature has kept this CO2 in balance for millions of years. The CO2 emitted from FireBox burning for forest fuels remediation and wildfire mitigation, though at first glance possibly perceived as substantive and released over a short time span, is minuscule within the scope of all released CO2, both natural and anthropogenic, and can be neglected. Also, if fuels reduction efforts were not enacted and the forest slash, for example, not burned in a FireBox, then one could argue that a more likely forest fire would eventually destroy the same mass of wood in a short time span, releasing not only the same amount of CO2, but also massive amounts of black carbon or smoke, a bad climate change forcing agent. Of course, that would also endanger the rest of the woodlands themselves and the urban developments interfacing with the wildland. The Words "Air Burners", "airburners" , "BurnBoss" and the Air Burners Logos are Registered Australian Trademarks of Air Burners, Inc.